Their Gotcha Day is less than 48 hours away!! Such happiness all around as our family will officially be joined by our rambunctious Teague and Trenton on Sunday! Last night, we were given such good news from one of our facilitators here in Ukraine. She called to tell us that ALL of the children's passports will be in today; sooner than we expected. We were expecting a significant delay with Maclayne's passport because of regional bureaucracy. David and I immediately started praying that God would intervene so that her passport would come in with the boys'. Our facilitator told us that if we didn't get Maclayne's passport with the boys' on Monday, then she would start working on "Plan B". The last thing she told us on Wednesday was to begin praying now and not to stop until Monday. To be honest, we were a little nervous about Maclayne's passport being delayed. But as I posted on my Facebook page, who am I to think that God would allow something as small as a passport get in the way of bringing all three of our children home?!? 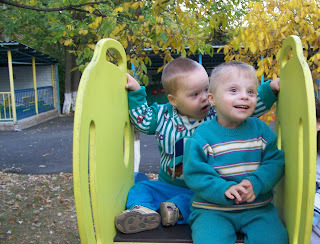 Besides, He was the One who had called us to travel to a foreign country and adopt three special needs orphans. is Trenton plotting to bite Teague's ear clean off his head? Sure looks like it! Either that or head-bash him! Welcome Home! My name is Rachel Whitmire and I'm the Post-Adoption Care Coordinator for Reece's Rainbow. I wanted to leave you a note and let you know I'm available if you guys need anything. Sometimes adjustments can be hard and it helps to have someone who's "been there" to talk to. Please don't hesitate to contact me if I can help in any way. Also, make sure you connect to the After the Rainbow yahoo group. There are so many great families on there and it's a great source for support and advice. Shoot me an email if you don't know how to access it. How are they doing? How are you doing? I would love to see an update! would love to see an update also!!! !